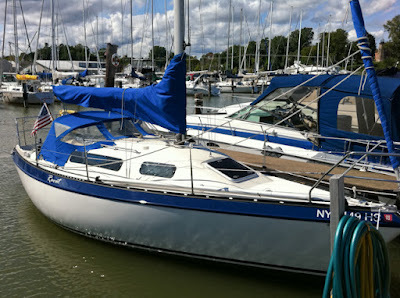 Since the weather seems to be trending towards getting colder, and the winds seem to be increasing I felt it was time to prepare the boat for cool weather sailing. Ravat came with a dodger which is in fairly good condition. The Sunbrella is in great shape. The stitching is all solid, and the stainless tubes are great as well. The only minor issue is that the vinyl windows are slightly cloudy, but not terrible either. I love being able to keep the companion way hatch open when it's raining. I worked one morning in the rain and had excellent ventilation the entire time. What I don't like is that it really makes it hard to sail in shifting winds unless you are standing up at the helm. I sail by the feel of the wind on my face, and this thing (by design) has a big impact on that function. It also makes it more difficult to flake the main sail when I'm single-handing because I need to reach over it where I used to perch in the companion way. I can get used to that though. I think I'll keep it on until I haul the boat, as it really is great when you get chilly.